Scotland’s leaders feared that the warming of relations between Libya and the United Kingdom would force Scotland to hand over the Lockerbie bomber, Abdelbeset Ali Mohmed al Megrahi, documents released by the British government Tuesday indicate. Scottish First Minister Alex Salmond expressed his concerns repeatedly to the central government in London about the issue in June 2007, prompting several replies from then-Lord Chancellor Charles Falconer. “No deal has been done to secure the transfer of Mr al Megrahi to Libya,” Falconer wrote on June 22, 2007. 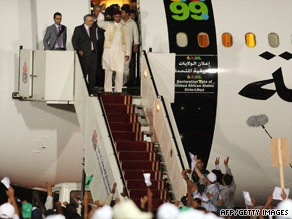 “We have made clear (to Libya) on diplomatic channels that, for any reason, any Prisoner Transfer Agreement with Libya could not cover Mr al Megrahi,” Falconer said, adding that under the terms of relations between London and Edinburgh, any steps regarding al Megrahi’s future “will ultimately be for Scottish Ministers to take.” Britain’s Ministry of Justice released the London side of the correspondence Tuesday in response to newspaper claims that London had set the Lockerbie bomber free as a part of a deal for BP to drill for oil in Libya. Prime Minister Gordon Brown and Justice Minister Jack Straw have forcefully denied the allegation. But Straw admitted Sunday that Britain had ultimately caved in to Libyan demands to include al Megrahi in the prisoner transfer agreement between the two countries. However, when Al Megrahi was released last month it was because he had terminal cancer, not as part of a prisoner transfer agreement. He had been serving a life sentence for the bombing of Pan Am 103 in 1988, which killed 270 people.